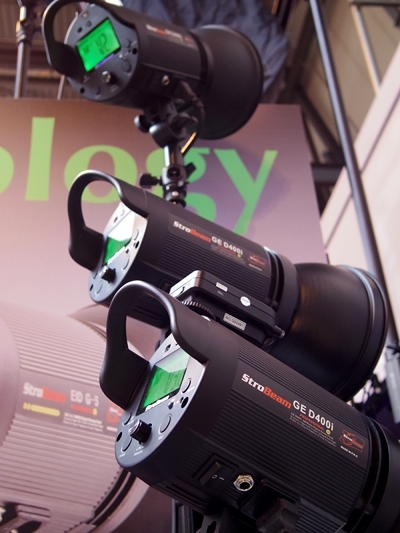 Following on from the wireless systems report, here’s what I found out about new studio flash systems at Focus On Imaging 2012 this week at the Birmingham NEC. 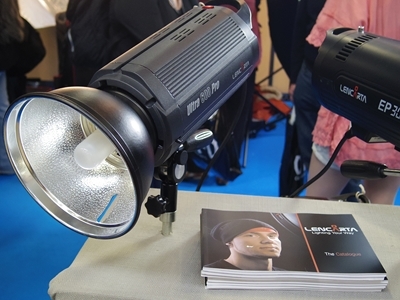 English studio lighting company Lencarta had a large stand, showing off their latest products and giving lighting demonstrations. 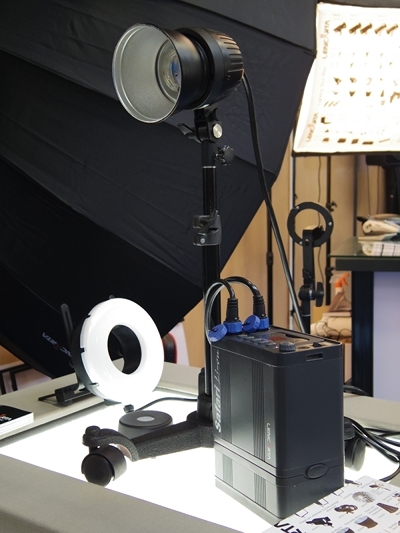 I got a chance to go hands-on with their latest studio flash, the UltraPro. 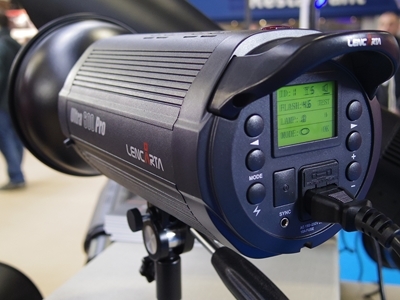 Garry Edwards explained how and why the Lencarta UltraPro and Jinbei Digital Pioneer DPsIII are two different lights. In aid of this, the original Jinbei DPsIII uses direct current (DC) capacitors, which have the advantage of running cooler (and can also have more consistent colour) but recharge much more slowly. The Lencarta UltraPro, by contrast, uses alternating current (AC) capacitors, which recycle faster. This was immediately obvious from a quick demonstration. The Ultra 600 Pro – which is 100J more powerful than the DPsIII-500 I have – fired a sequence of shots at full power, recycling almost instantaneously each time. The Digital Pioneer’s recycle speed is a sluggish two seconds, and it shows. The one-handed tilt bracket is much nicer to use, and I think all lights these days should have one like it. I was also told that the optical slave cell in the Ultra Pro is superior. 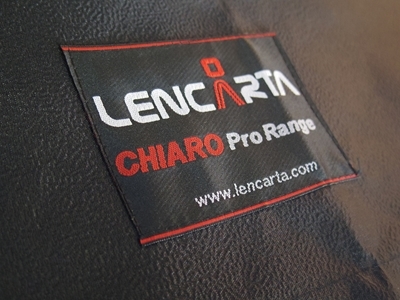 The Ultra 300 Pro and Ultra 600 Pro cost £200 and £260, respectively, direct from Lencarta. That’s actually cheaper than their counterpart Jinbei lights sold on the continent. I was told that the Safari Li-ion is also improved over the Jinbei Discovery, as it has “two extra capacitors” inside for better performance. Kits start at £800. Previously a brand under Viewfinder Photography, the StroBeam brand has been relaunched as its own venture. 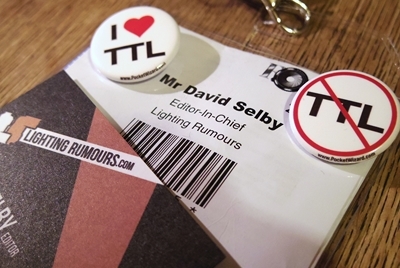 The products on show could be enough to turn the portable lighting market on its head. 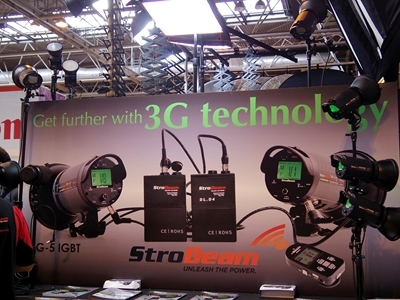 All of StroBeam’s innovative new lights are controlled by their advanced 3G wireless system. It actually runs on the 2.4GHz frequency band, so why the name “3G”? As company founder Sam explained, the StroBeam 3G system is “more stable” and experiences “less interference” than the most popular parts of 2.4GHz used by Wi-Fi and other wireless triggers. 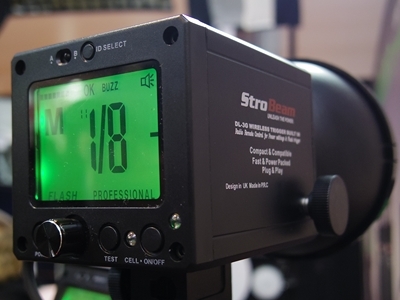 The StroBeam GE D400i is a 400J mains studio flash and the equivalent of the CononMark GE400 I reviewed last week. Apart from the built-in radio transceiver for the 3G system and huge LCD screen, there are few bells and whistles to be found here. However, I was told it uses high quality Rubycon capacitors, and is therefore superior to the CononMark brand version, which presumably uses cheaper Chinese ones. Prices, including VAT, start as low as £330 for a one head kit or £720 for a three head kit including a carrying case. 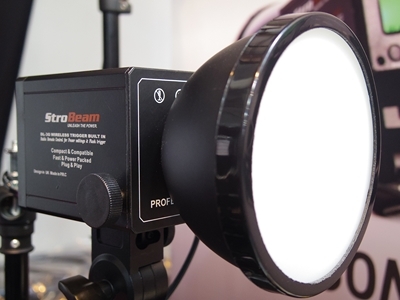 Like the GE D400i, the StroBeam EID G-5 uses a standard Bowens S-fit bayonet accessory mount. However, it is packed with cool stuff like AC/DC (powerable via an optional lightweight battery pack) and IGBT circuitry. The G-5 has a “rather leisurely flash duration at full power” according to photographer Jonathan Ryan, but becomes much much faster at lower power settings. In high speed “FP” mode, it was measured to achieve an astonishing 1/9,600 second flash duration. You can see a demonstration of the EID G-5’s action-freezing abilities, described as “the holy grail of location lighting” on the StroBeam web site. A single G-5 with battery pack is £750. You won’t find a Bowens-fit model under the CononMark brand. 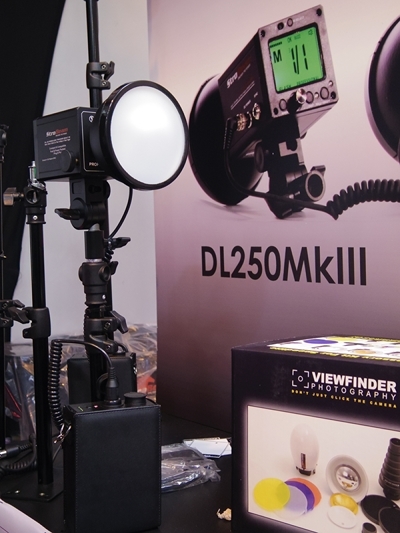 The DL250 Mark III is a portable flash design you won’t find anywhere else. Where are the Mark I and II? Exactly. 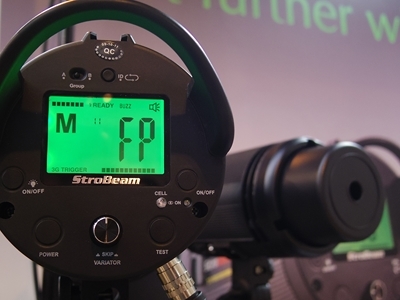 It took years of development before StroBeam were happy for it to reach the market. The DL250MkIII has all the IGBT features of the EID G-5, but is exclusively battery operated and much more compact for location use. 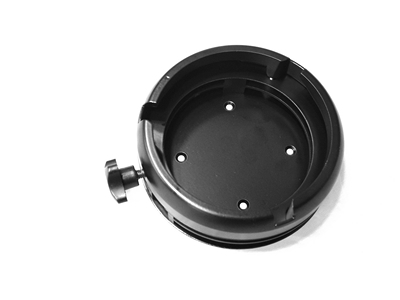 The included spill-kill reflector can be removed to expose the bare bulb (which is user-replaceable, and protected by UV-absorbing glass) and attach optional accessories such as a snoot or a softbox adapter. A single head kit starts at £600 including VAT, going up to four head kits from £1740. Two heads can run from each battery pack. Visit the StroBeam web site for further information on any of these products. Lastly, I was shown something a bit more mundane for the untidy studio owner: a Bowens bayonet you can mount on the wall so you can store your lighting accessories neatly when not in use.